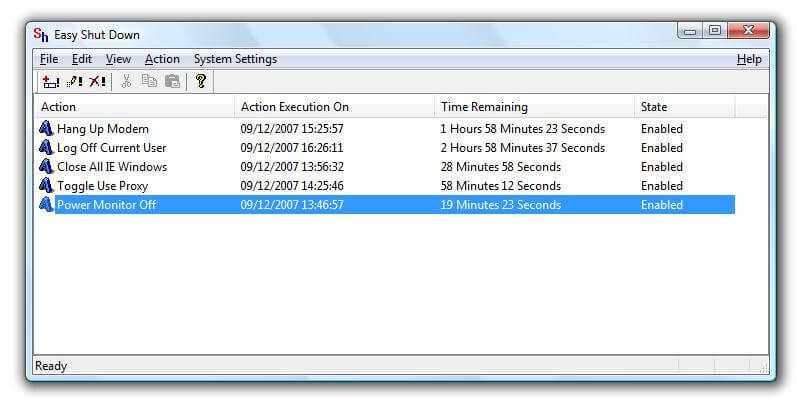 Shutdown Computer automatically, Power Off, Schedule Daily Shutdown, Restart, Automatic Hibernate and Resume, and much more in small software utility. Free to try Windows Utility. Schedule Automatic,Daily,Timer Based ShutDown & Other Actions provided in an Easy Way. 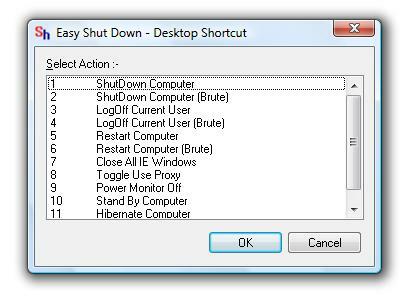 Easy ShutDown provides easy way to ShutDown Computer Daily/Weekly. 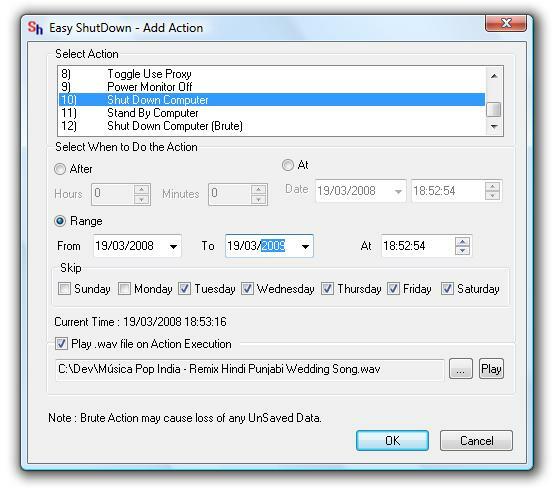 Easy ShutDown provides easy way to add other actions to be performed Daily/Weekly. Power Monitor Off whenever you want & Save Power/Electricity using Keyboard with a Hot Key. Log Off using Keyboard with a Hot Key. Restart Computer using Keyboard with a Hot Key. ShutDown Computer using Keyboard with a Hot Key. ShutDown Brute(ie All Unsaved Data will be Lost) Computer using Keyboard with a Hot Key. Close All Open Internet Explorer Windows using Keyboard with a Hot Key. 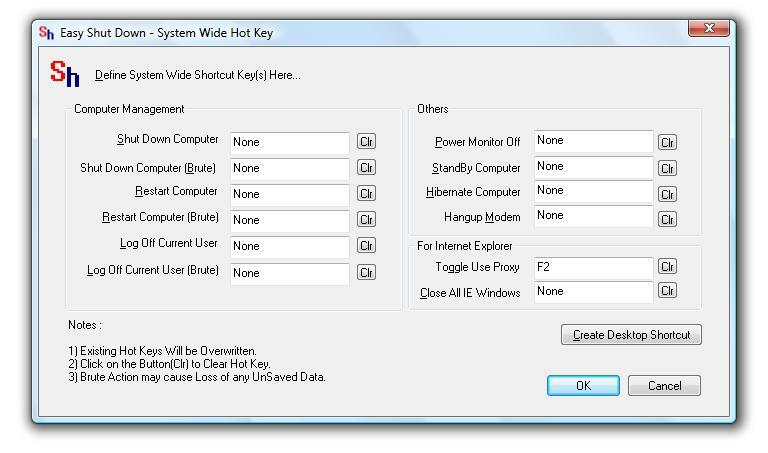 Toggle Use-Proxy Checkbox Of Internet Explorer using Keyboard with a Hot Key. Trial Version Allows to run above features upto 30 times(including all). Trial Version Does not have any Naggin Pop-Ups. Upgrades for Registered Users at No Extra Cost. Registered Users Can send request to get relative feature(s) added(at no extra cost). Register for $5.00 & get Free Upgrades as well. Create Desktop Shortcut to Shutdown, Restart, Log Off, and many computer control features. Your feedback is important to us & can help us to improve the service provided. You can send us feedback at feedback@easyshutdown.com. For any Sales Issues,Please write to sales@easyshutdown.com for any concerns/issues. For any Other Issues/Concerns,Please write to support@easyshutdown.com.